← T. T. Shields ‘Second Fiddle’ to A. E. Greenlaw… Who? Elva Selman, a 24-year-old member of First Baptist Church, died in the waters off Second Beach on Friday, August 21, 1908 at around 11am. She was the daughter of Samuel and Clara Selman. Samuel was a realtor in the City at the time of Elva’s death. 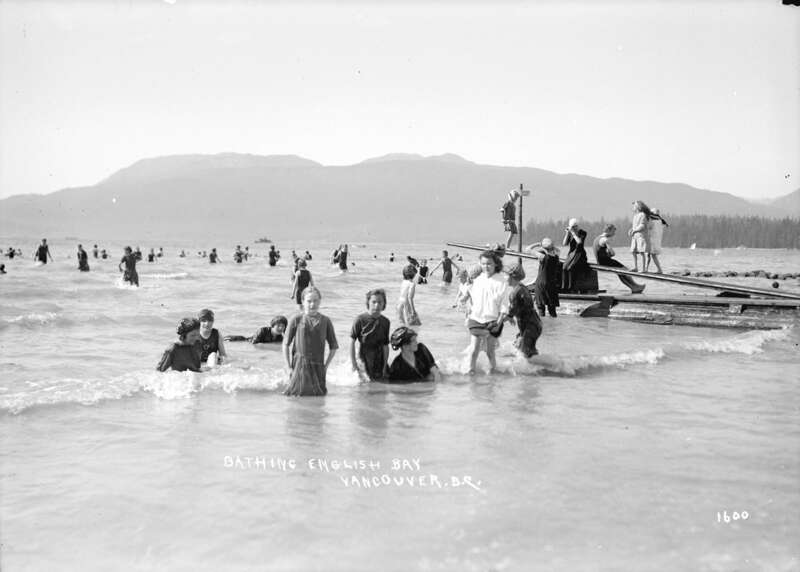 Elva apparently was wading in English Bay, using crutches to help her remain upright. She had had surgery about a year earlier (for reasons not explained in the Vancouver Daily World). “Miss Selman was somewhat crippled, and went into the water on crutches. None of the party saw the accident, but it is presumed that she must have lost her balance. Her absence was noticed and a quick search in the water resulted in the body being found within fifteen minutes. It was hoped that life might not be extinct and several men worked willingly for over an hour in a vain attempt [at] resuscitation. Immediately the accident was reported the police patrol, with a doctor, was hurried to the scene, and was later used to convey the body to the family home on Nelson Street.” (Vancouver Daily World, August 21, 1908). I assume there was no autopsy, since the funeral service was held the next day, on Saturday the 22nd. Elva’s death happened between senior ministers at FBC. Dr. J. Willard Litch had left FBC a year prior, and it would be almost another year after her passing before H. Francis Perry would take up pastoral duties at First. Her Saturday service was, therefore, led by Rev. P. Clifton Parker (of the long-gone Central Baptist Church, Vancouver at Laurel and 10th) with assistance from veteran B.C. Baptist pastor, Rev. Peter H. McEwen, and another pastor who was in the city to supply the pulpit at First for a couple of Sundays, Rev. T. T. Shields. Albert E. Greenlaw was also on hand to render a solo. Following the service, a special B.C. Electric train car was commissioned (at no small cost to the family, I suspect) to convey mourners from FBC to the graveside at Mountain View Cemetary. SGN 1015 – Bathing. English Bay. Vancouver, B.C. 1912? W J Moore. (This looks like a scene not unlike that on the day Elva Selman drowned). This entry was posted in churches, First Baptist Church, Vancouver, sports and tagged Albert E. Greenlaw, bc, Dr. J. Willard Litch, Eva Selman, history, Rev. P. Clifton Parker, Rev. Peter H. McEwen, Rev. T. T. Shields, samuel and clara selman, vancouver. Bookmark the permalink. Thanks for tracking down Elva’s death certificate. I appreciate it. I was aware that certificates are quite often available through familysearch.org, but more often than not I find them in the Royal B.C. Museum’s vital stats database, and so that is my usual source. Forgot to check familysearch when there was no death cert. available at Royal B.C. for Elva. Thanks again. On her birth certificate and on the 1891 census (when the family were in Ontario) she was named as Ella, and in the 1901 Census (when the family were living in Victoria) she was Elba, so her name is by no means fixed! Samuel Selman was the developer of a building on West Pender in 1908, in partnership with Dr. H W Riggs. It’s still standing today, renamed the Victory Block.